Guard of Honour of current Mahal volunteers at the Mahal Memorial on Yom Hazikaron 2011, together with Mahal 1947-49 volunteers Migdal Teperson, Smoky Simon, Joe Woolf and Ruth Stern. Mahal-IDF-Volunteers.org is the leading guide for all would-be overseas enlistees (non-Israelis and Israelis) prior to joining the IDF (Israel Defense Forces). It is not an official website of the State of Israel but a voluntary initiative aiming to assist you - from retrieving reliable information to pre-checking your qualification and being your one-stop-assistant until your enlistment. All services are free and donations are not accepted. This website got the "Jewish Agency Top Site 2005" award. idf israel - 6th and 7th. IDF Mahal and the other IDF programs listed on this website are the administrative gates for the simplified enlistment of non-Israelis and overseas Israelis. Their actual IDF service is shoulder to shoulder with regular Israeli soldiers, even if the minimum service time is usually shorter than the regular IDF paths. Otherwise there are no major differences. The programs aim to contribute to Israel's defense and to provide experienced and enthusiastic young leaders for Jewish communities. 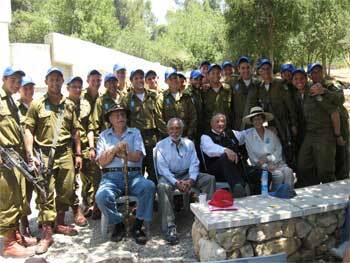 The following programs enable young Jews from all over the world to volunteer for the IDF. The Mahal program is for men younger than 24 and women younger than 21. Eligible are non-Israeli Jews, descendants of a Jewish grandparent of the aforementioned. The program consists of 18 months of IDF service. The Mahal Nahal Haredi program is for non-Israeli religious (haredi) Jewish men younger than 24. The program consists of 18 months of service in a separate IDF Nahal Haredi Infantry combat unit. The Mahal Hesder program is for non-Israeli religious (dati) Jewish men younger than 24. The program consists of 6 1/2 months of studies in a Yeshivat Hesder (IDF Rabbinical College) followed by at least 14 months of IDF service, in total 20 1/2 months. Thousands of young people from more than 40 countries have already joined the IDF through its exciting programs for overseas volunteers. This message is for all - present and future - volunteers who submitted their registration but failed to get our reply: Most likely, your registration arrived without email address or with an incorrect one or went astray or our reply landed in your spam folder. Please view your spam folder first or reregister here and you should get our reply within 3 workdays. May 12, 2005. Veteran foreign volunteers who fought in the War of Independence held a stirring meeting Wednesday with present-day volunteers in the IDF. August 22, 2004. It's dangerous, difficult and sometimes brutal. So why would North American kids want to serve in the IDF? In this article, some of them explain why they're here. RAMAT GAN. Mahal volunteers experienced their first day in the IDF at the BAKUM induction base today, where they received their IDF uniforms and equipment.